Everyone loves the sheer power of a towering home run. Fans marvel at the blistering speed of runners on the basepaths. But defense? A slick glove doesn’t seem to get quite the respect of the other five tools. 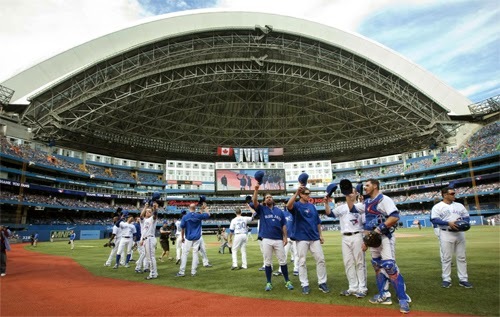 Defense was not something that was particularly on display very often this year with the Toronto Blue Jays, with the exception of perhaps one player: Brett Lawrie. 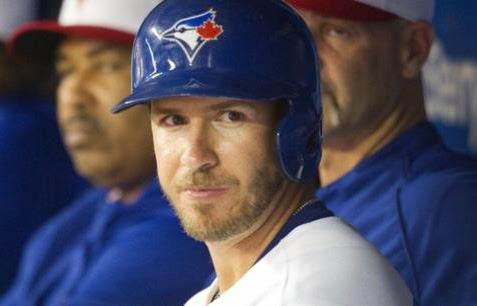 Although he dabbled at second base, Lawrie’s skills were that of a natural third baseman. Although injuries limited his play to 107 games played with the Blue Jays this year, his stellar work at the hot corner provided a year’s worth of highlights. Here are the ten best defensive plays from 2013 by Brett Lawrie. Brett Lawrie spent the first few weeks of the season in the disabled list, but in his very first game of the 2013 campaign, he was already in mid-season form. This is just the first of many impressive bare-handed throws by Brett Lawrie on the list. From a defensive aspect, Brett Lawrie is everything anyone can ask for; he’s agile, he covers lots of ground, and he has a heck of an arm. All three of those skills are on display in a single play by Lawrie. Admittedly, the degree of difficulty on this play is ramped up unnecessarily due to some miscommunication between the pitcher and the infielders. But had it not been for the quick actions by Brett Lawrie, the Blue Jays may have been on the blooper reel for letting that ball drop by the mound. In the early going of the season, the phrase “double play” is not one that was heard very often on the Blue Jays broadcast. However, in this instance Brett Lawrie’s quick reflexes at third helped turn a phenomenal 5-4-3 double play. How many third baseman do you know that can make a throw deep in the hole at third base, on the grass in left field, and make a strong, accurate throw from across the diamond? I present to thee, Brett Lawrie. Brett Lawrie’s incredible range is one of the things that makes him such an amazing athlete. Here, Lawrie ranges to his left and just plain lays out to snag a liner and rob extra bases. Stop me if you’ve heard this one before; Brett Lawrie makes an incredible barehanded throw. Brett really has perfected the art form. But this time, he’s forced to change his direction mid-play as the ball bounces off J.A. Happ’s glove beforehand. One of the things that makes Brett Lawrie such an asset is he’s often able to get to the ball where most third baseman would not be able to otherwise. Here, Brett comes in all the way from third base, and makes a strong bare-handed throw that was right on the money. Two young players that will inevitably be linked together due to their position and defensive prowess are Brett Lawrie and Manny Machado. Both guys made highlight reel catches and throws all season long. Manny Machado pulled off what was quite possibly the best defensive gem of the year with a leaping throw from foul territory. This play was basically Brett Lawrie’s answer as to whether or not he was one of the league’s elite fielding third baseman. While both plays were extremely impressive, I’m almost apt to say Lawrie’s was a little more difficult because he made the throw mid-air with his momentum taking him in the opposite direction of the throw. Truth be told, the degree of difficulty on this play doesn’t seem all that high. 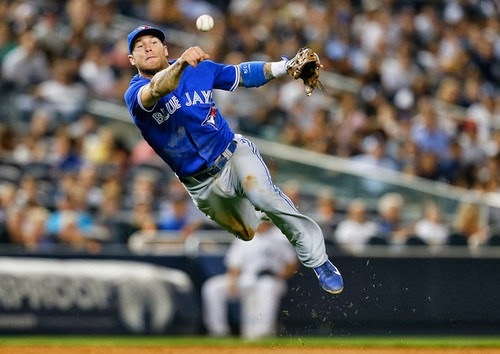 But the fact that Lawrie was able to time his leap, make the throw mid-air and still manage to nab the runner at first makes this one Brett Lawrie’s best defensive play of the season.